Michael Bloomberg/Chief Black Eagle Edition - PERFORMANCE 360 V. 20, I.2. PERFORMANCE360 Magazine - What You Need To Succeed - A magazine of powerful how to oriented success articles written by power personalities for your exclusive mental DNA. 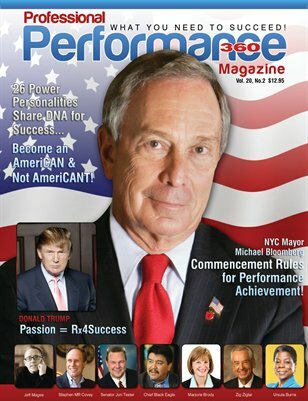 In this Edition exclusive success, achievement focused article’s from: Mayor Michael Bloomberg, Bill Bartmann, Robyn Benincasa, Jim Britt, Marjorie Brody, Ursula Burns, Shirzad Chamine, Stephen MR Covey, Berney Dohrmann, Chairman Cedric Black Eagle, Lee Ellis, Paula Fellingham, Patricia Fripp, Bill George, Bob Goshen, Alex Honnold, Harvey Mackay, Jeff Magee, Danny Nelms, Rabison Shumba, David Stanley, Jim Stovall, Senator Jon Tester, Donald Trump, Alan Weiss, Zig Ziglar.